The Word for Word 2011 Season had a busy debut. 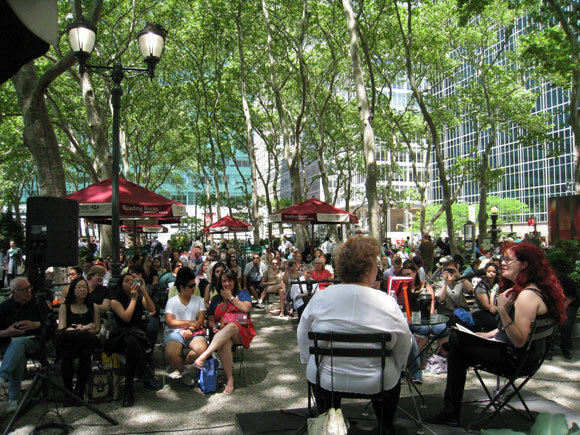 Charlaine Harris, author of the Sookie Stackhouse series, visited the Reading Room last Wednesday, and Mary Gordon made an appearance this week to discuss her novel The Love of My Youth. Matthew Gallaway and Seth Colter Walls led a Word for Word Book Club discussion on David Foster Wallace's posthumously published The Pale King. Word for Word Poetry got off to a musical start with a live broadcast of WFMU's Antique Phonograph Music Program and a visit from Michael Cumella. There is truly something for everyone at Word for Word, which has nine different subcategories of events. Pick up a free book, courtesy of Oxford University Press, and join in one of six Book Club discussions. Or brush up on your history in July and August with Civil War lectures at Word for Word 101. 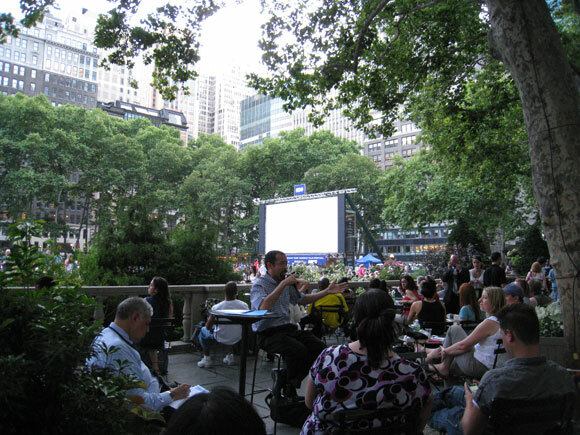 Film buffs can enjoy Word for Word Reel Talks, while waiting for the HBO Bryant Park Summer Film Festival to start each Monday night. Reel Talks will include film trivia, chances to win a Film Fest snack pack, and drawings for a DVD copy of the evening's featured film. Film expert Scott Adlerberg leads a Reel Talk before Goldfinger last summer. If you still haven't been convinced to check out the Word for Word Schedule, take NPR's advice. Their list of top summer reads includes four authors scheduled to visit the Reading Room this summer. Sports fans will enjoy next week's Word for Word Author event. Two-time All-Star and former NY Mets right fielder Shawn Green and Cincinnati Bengals linebacker Dhani Jones will discuss what it takes to be a professional athlete with WFAN’s Rich Ackerman.